Do you know how energy efficient your heating systems are? Or how much of the heat you pay for is lost through doors and openings? You might find that you are paying to heat parts of your premises unnecessarily, when you could be using more focused heat sources. An air curtain is a great alternative to fast-acting roller doors and PVC slat curtains. 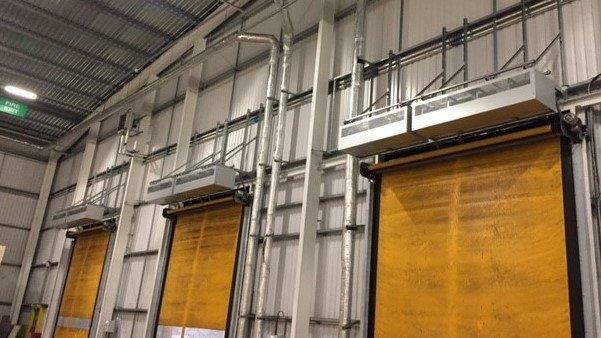 They provide a solution to heat loss through doorways; this is done by the delivery of a powerful barrier of heated or ambient air across the width or down the length of a doorway that can help to reduce the running costs of the building by reducing the amount of heat loss and disruption to employees. 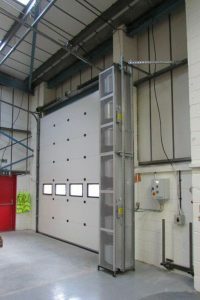 These units are ideal for use on loading bays, factories, hangars, etc so that forklift drivers don’t have to get out of their cabs to open and close doors making moving from one area safer and more convenient. The open door not only causes discomfort but greatly increases energy loss and the running costs of the building. Air Curtain units offer a cost-effective, energy efficient solution to these problems. Units can be easily fitted within existing or new buildings and are ideal for open doorways. The most commonly used application is to use the ambient heat from within the building that is made up from heat generated by lights and machinery …… To create a barrier of warm air across the doorway. There is also an Option to for the Air Curtain to be heated via a natural gas burner, which provides additional heat to the Air Curtain which will also compliment the internal heating system of the building. 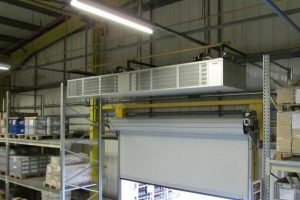 Units are best mounted horizontally above the door to enable high-level warm air to be re-circulated to working level. Where over-door mounting is not possible, alternative units are available which may be mounted vertically at one or both sides of the door.